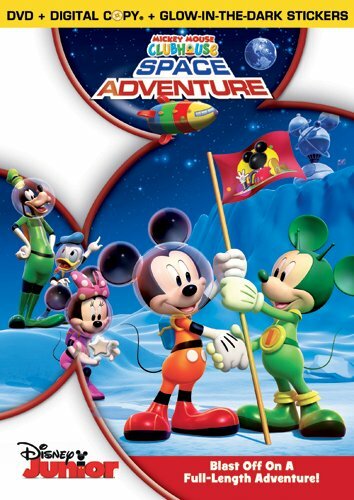 We are big Mikey Mouse fans, so we were excited to watch the Mickey Mouse Clubhouse: Space Adventure DVD that was just released onto DVD this month. the Out-of-this-World Treasure, their ultimate goal. The interplanetary trip takes preschool viewers first to the Moon, Mars and the Rings of Saturn. Along the way, the gang gets help from friendly space aliens Moon Men Chip and Dale, Martian Mickey and Pluto from Pluto but they also encounter sneaky Space Pirate Pete, who wants the Treasure all for himself. Eventually the Clubhouse Rocket’s crew and Space Pirate Pete manage to become friends, and they all follow the trail of the Treasure Stars to the mysterious Planet Mickey where they discover the location of the Out-of-this-World Treasure. It turns out to be a futuristic, space age version of the Clubhouse — the perfect meeting place for all pals across the universe! This is a cute Mickey video that will keep your little one entertained. This DVD is 70 minutes long and includes the Never-Before-Seen Episode (Until At Least 1/3/2012): “Goofy’s Thinking Cap“. Our copy of the DVD even had some very cool glow in the dark Mickey Mouse stickers that my daughter immediately had to use. Now time for some fun FREE Mickey Mouse Space Adventure Coloring Pages that you can print to color! Got a Mickey Mouse fan on your shopping list? The Mickey Mouse Clubhouse: Space Adventure is available on DVD + Digital copy right now on Amazon for only $15.99.